Switching to a healthier lifestyle doesn’t happen overnight. It occurs one habit at a time. You can start on the road to a new healthier you the minute you develop a new healthy habit. While I focus on a healthy diet and regular exercise, getting adequate sleep, good hydration and eliminating or dealing with stress are also important. If you smoke, abuse alcohol or drugs, it’s time to step back and take action, too. No matter what habit you choose to adopt, it’s one step closer to the healthiest you possible. Consider starting with healthy eating if weight loss is your ultimate goal. You can’t out-exercise a bad diet. Eating healthier is the cornerstone for weight loss. There’s a lot to learn when it comes to healthy eating, so making smaller changes can be the start. Eliminate junk food and stock up on healthy snacks. If you’re like most people, snacking is often one of the killers when it comes to weight loss. Having healthy snacks like fresh fruits or vegetables ready to eat can help you cut calories far easier. Try making healthy meals ahead and have them ready in the freezer to pop in the oven when you get home from work. Those two habits will make eating healthy far easier. Set a time each day for exercise. Maybe it’s first thing in the morning or right after work, but a scheduled time is important. Don’t just try to fit it into your day or you’ll find your plans failing. If you have a busy unpredictable schedule, like most people, have a back up plan with ways to have shorter workouts several times throughout the day. They could be as simple as walking up and down the stairs on your break at work or a quick 10 to 15 minute workout to do three to four times a day. Sometimes doing more than one at once can be a benefit. Through the years, I have had many people who start working out at the gym because they either quit smoking or were about to quit. They were trying to replace the habit of smoking with the habit of working out and wanted help with a healthier diet, so they didn’t face the weight gain that often occurs. It’s a smart plan and often works. 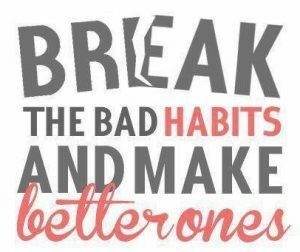 Not only are you quitting one bad habit, but gaining two good ones. I had one client that told me that every time he was really tempted to smoke, he went for a walk or if he was at home, dropped and did push-ups. You might be exercising, eating healthy and don’t use tobacco, illegal drugs or alcohol, but still have a bad habit. Lack of sleep is often one of the problems busy people face. Get in the habit of going to bed at a specific time. If you have problems sleeping, try getting up earlier the next day. That helps. Don’t forget to hydrate. Adequate intake of water is important. Carry a bottle of water with you at all times and sip throughout the day. Smile more. People who smile live longer, according to studies. Start right now and smile, even if it feels silly. You’ll feel happier immediately. If you want, laugh out loud…it feels great. Relax. Learn meditation, deep breathing or other ways to relax. Stress is a killer and while exercise helps, stopping the effects immediately is better.